1. Cook the peas for 2 minutes in boiling water, drain, then cool under fresh cold water. Set aside. Place the spinach in a colander, pour over a kettleful of boiling water to wilt, run under cold water to refresh then squeeze out the excess moisture with your hands. Chop and set aside. 2. Place the peas, spinach, chickpeas, garlic, flour, cumin, chilli flakes and some seasoning in a food processor and blitz to a rough paste. With damp hands, roll the mixture into about 20 walnut-sized balls. Place on a large plate, cover and chill until ready to cook. You can do this up to 4 hours ahead. 3. Preheat the barbecue to high, if using. Mix the onions and lemon juice together and leave for 20 minutes to soften their flavour. 4. Warm 1 tbsp of the olive oil in a large frying pan on the barbecue or over a medium heat. Fry half of the falafel for 5 minutes, turning frequently, until golden on each side. Remove and keep warm in the oven or on the side of the barbecue while you cook the second batch in the remaining oil. 5. Warm the pittas on the barbecue for about 1–2 minutes, turning occasionally, or according to the instructions on the pack. 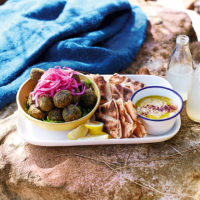 Serve the falafel with the warm pittas, red onions, houmous, a rocket salad and lemon wedges.